Oct. 31 marks the annual celebration of Halloween, but for some the dressing up as anonymous and often scary characters has taken on a new meaning. The fall has brought dozens of reports across America of “creepy clowns” disturbing the public, and Loudoun is not immune. In October alone, the Loudoun County Sheriff’s Office (LCSO) reported two unsettling clown sightings. On Oct. 16 a juvenile reported that while running in a group along a trail at the intersection of Plymouth Pl. and Shellhorn Rd. in Ashburn, he observed a man leaning up against a tree who appeared to be sick. The report said the juvenile told deputies that when the group approached him, the man lunged forward and began chasing them. The man’s face was reportedly painted like a clown and he was wearing an orange hat, dark purple or maroon puffy shirt, and dark pants. On Oct. 26, there was a report of a suspicious person scaring children at a Sterling playground while wearing a clown mask and carrying a baseball bat. Even before the clown sightings this month, the LCSO released a statement in response to fears sparked from social media posts citing clowns in the area and threats of violence at local schools. “Although there have been no credible threats at this time, as a precaution the Loudoun County Sheriff’s Office will be conducting directed patrol in the area of schools,” the statement said. It also reminded residents that all public schools are assigned a school resource officer, with deputies stationed at middle and high schools. 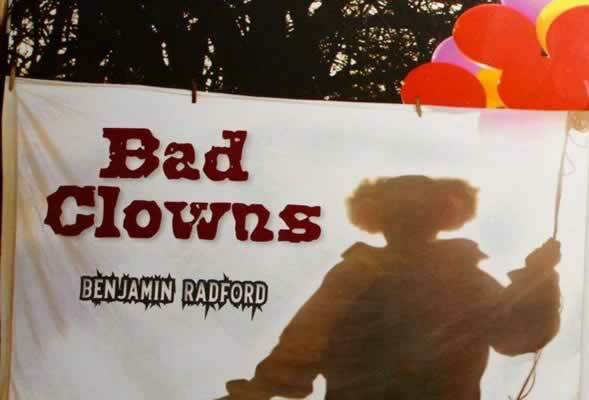 Although there’s little credibility to threats of attacks from clowns, this hysteria is understandable in today’s social climate, says folklorist Benjamin Redford. He cites an active hurricane season, increased focus on police shootings and a contentious election cycle as part of the fear. These fears are manifesting themselves in irrational fears, Redford says, and it includes clowns. Redford says it’s not surprising that clowns a focus. Clowns are usually masked and this anonymity naturally leads to fear. Also contributing to the fear is the popularization of the evil clown like the Joker from the Batman comics and movies, Sideshow Bob from the Simpsons television series and Pennywise, the evil clown in Steven King’s novel and television mini series It. But in his research, Redford said he discovered that, despite these fears and characters, most people don’t actually fear clowns. Much of the cultural attribution to clown fears is traced to a study from a few years ago that claimed that most children feared clowns, Redford said. The problem was that what the study found was that kids in hospital didn’t like clown photos on the wall. The study did not find a widespread fear of clowns. In his findings, studies like these and the recent panic has been tough for the actual clowns, Redford said. The head of Clowns of America, the nation’s largest professional clowning organization, declined to speak to Redford for Bad Clowns. Several clowns who spoke with Redford said they were embarrassed by the recent rash of “creepy” clowns and irritated by the popularity of the evil clown character because it distracts from some of the positive work of actual clowns. “If you put on the mummy mask, it doesn’t make you a mummy. Putting on a vampire mask doesn’t make you a vampire and putting on a clown mask, doesn’t make you clown,” Redford said. Going forward, Redford expect the current fear around clowns to die down shortly, especially with the passing of Halloween. But this doesn’t mean we’ve seen the end of this fear. He said these fears are cyclical. In the 1980’s, school children in Massachusetts said they saw clowns trying to abduct them, though the claims went unfounded. There have been several similar reports resurfacing since then. With the likelihood of more social panics in the future, combined with the inherent cultural fear of clowns, Redford says we can expect more sightings in the future. Dr. Michael Oberschneider, noted clinical psychologist and the founder and director of Ashburn Psychological and Psychiatric Services, recently published a commentary on clowns for the Tribune.